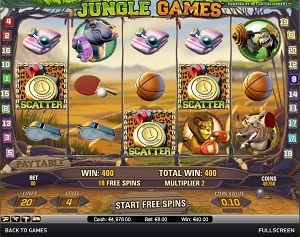 Jungle Games is a sporty online video slot machine game from Net Entertainment that has been released in June 2010. This online video slot game has 5 reels and 20 pay lines. The theme of Jungle Games is somewhat inspired by 3D animated cartoon films that we see on TV, like Madagascar, Ice Age, or Kung Fu Panda, but in this slot game, African animals get to play their own favorite human sports activities! Most people typically notice that the whole slot game is not themed like its name “Jungle Games” suggests. Instead, it’s more like the theme is set at the African savannah. The “games” they are pertaining to are the different African animals themselves, who are each competing at their own designated sport such as a boxing lion, weightlifting gorillas, a giraffe playing basketball, and swimming hippos! The concept of the theme is so quirky and funny, you will surely love to stay and play for a while. Lots of online slot players would love to play for free first whenever they come across a new online slot game so that they can find out if they like that game enough to spend real money in it. Thus, whenever they see that a particular online slot game is powered by Net Entertainment, they are certain that they can instantly try to play that game, without the need to download anything! Jungle Games online video slot is an absolute joy to play at, especially for those who love watching 3D animated cartoon films. Jungle Games offers a special Pick Win feature, Free Spins, Wild and Scatter symbols, multipliers, a maximum cash jackpot of $4,000, a maximum coin jackpot of 8000, and last but not least, it has a high 96.6% payout ratio! Net Entertainment is renowned for their quality graphics and realistic sound effects when it comes to their huge variety of online video slot machine games. In Jungle Games, they really have done a wonderful job of incorporating a video slot game together with a safari-type theme. Jungle Games, you would imagine that the setting is supposed to be in a jungle, but it turns out it’s in the African savannah. The animals there are actually having fun playing with different sports (makes sense with the name of the title “Games”). The symbols are drawn in a very artistic and funny way (how would you draw animals with sporty gear? ), and in the background of the reels, you will see marathon lines drawn on the dusty road of the Savannah. Trees and grass that are native to the Savannah desert are also included to make the ambience more realistic. You will definitely love to stay and play for a while as this game will not strain or hurt your eyes. The overall graphic design of Jungle Games shows many different colors such as green, blue, purple, pink, orange, red, and of course, brown. The background sound effects that you will constantly hear are made from the animals of the Savannah – the growl of a lion, a bird squawking, a monkey laughing and, the chirping of crickets. These are the perfect background sounds that will surely make you think that you are actually at the African desert full of dangerous yet majestic wildlife! When you spin the reels, you will hear a short elephant’s trumpeting sound accompanied by drums. Trumpet-like celebratory music will fill your ears when you hit winning combinations. There are no card deck symbols available in the Jungle Games online video slot game. The regular symbols that you will find in Jungle Games are the boxer Lion, boxing gloves, the Rhinoceros, Table tennis paddle and ball, Gorilla, Barbell, Giraffe, a Basketball, Hippopotamus, a Swimming Towel, and a Whistle. The Wild Symbol is the Gold Cup Trophy. It acts as a substitute for all other symbols (except the Scatter symbol) in order to help you complete a winning combination. The Gold Cup Trophy Wild Symbol in Jungle Games is actually a Wild Multiplier Symbol. This means that it can double (multiplier x2) the payout of any winning combination you get, as long as it acts as a substitute symbol. There is only 1 winning combination to be paid out per pay line. If you get more than 1 possible winning combination on a pay line, you are then paid out the value of the highest combination only. The Scatter Symbol is the Gold Medal. The scatter symbol does not need to appear in a line, on an enabled pay line for you to win. The scatter symbol can be found scattered anywhere on the 5 reels, and you win coins when you get 2 or more Gold Medal scatter symbols in a spin. If you manage to get 3 or more Gold Medal scatter symbols, you will activate the Pick Win Bonus Feature game. Do take note that if you get a scatter win and a regular win, you will be paid out for both of them, because the Gold Medal scatter symbol is not needed to appear on an enabled pay line to win. Scatter rewards are entirely independent from pay line awards and they are added to the pay line win. Pick Win Bonus Feature – If you get 3 or more Scatter symbols (Gold Medal) that can be found anywhere on the 5 reels, you will trigger the Pick Win Bonus Feature game. When the Pick Win Bonus Feature game is triggered, you will be taken to a screen (with a crocodile on the center) wherein you are given the choice to pick either coins or free spins. If you choose the coins, you will be given a random Bonus Prize amount after clicking one of the three Gold Medal Scatter symbols being presented to you. Free Spin Bonus Feature Game – In the Pick Win Bonus Feature, if you choose Free Spins, you are to choose one of three Gold Medal Scatter symbols presented to you, which will reveal the number of Free Spins you will get, plus a multiplier value (maximum multiplier value is 5x). The Free Spin Bonus Feature game is very fun and exciting to play at because if you manage to get another 3 or more Gold Medal Scatter symbols while still playing the Free Spin Bonus Feature game, you are rewarded another set of Free Spins and the same multiplier value! The extra Free Spins are included to your remaining amount of Free Spins. While in the Free Spin Bonus Feature game, you can win an infinite amount of extra Free Spins! When the Free Spin Bonus Feature game is over, you are then taken back to the main Jungle Games slot game, and your Free Spin game winnings are included to your overall balance. Jungle Games has 5 reels where you may bet on as many as 20 pay lines. The minimum bet is 0.02 and the maximum bet is 1.00. You may wager from 1 up to 4 coins per line. Those who frequently play online casino games typically love to stay for much longer on online slot games that have an Autoplay function. Good thing that Jungle Games is equipped with one! You can have the game spin automatically for you with the Autoplay function that can be found either on the lower left side of their game screen or just beside the Spin button on the left. With the simple setting, just choose a button (from 10 to 1000) which means that those are the total number of spins that will be done automatically for you. With the advanced settings, you can choose to Stop Autoplay on any of the following conditions: on any win, if Pick win is won, if a single wins exceeds a certain amount you indicate, or if your cash increases or decreases by a certain amount you indicate. After putting in your preferences, just click on the Start button, and the game will automatically spin for you while you just sit back and enjoy playing the Jungle Games online video slot game!